Subjects and Themes(Dreaming): Women`s stories. artist who was involved at the beginning of the art movement in Papunya. Narpula Scobie's art is still evolving and she finds new ways of depicting the traditional stories of her Dreamings. 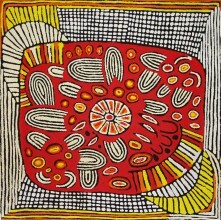 The majority of Narpula`s works depict bush food stories, reflecting her early life. Narpula has achieved considerable success over her career and her paintings are held in many collections locally and overseas.